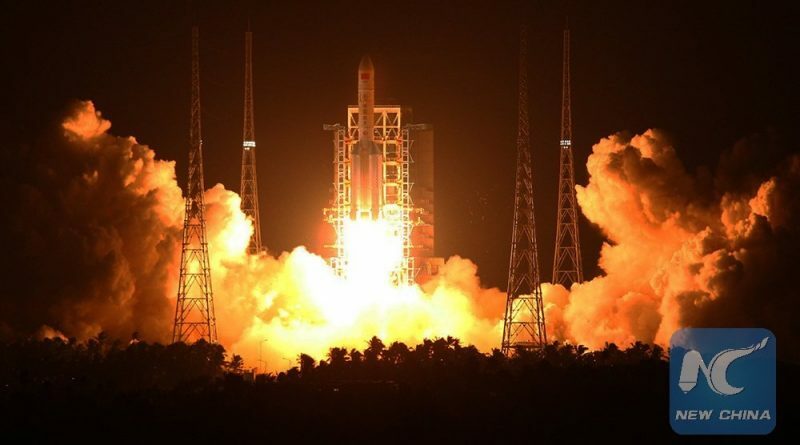 Long March 5 represents a cornerstone in China’s space ambitions and will be called upon for the launches of the country’s Space Station modules, beginning as early as 2018 with the Tianhe core module, heavy geostationary satellites that go beyond the capability of China’s current line of launchers, and interplanetary exploration missions such as the planned Chang’e 5 lunar sample return and 2020 Mars rover. Utilizing a combination of Kerosene and Hydrogen-fueled rocket stages, Long March 5 closely matches or even surpasses the performance of industry workhorses including the European Ariane 5, Russia’s Proton and the Delta IV Heavy, still holding the rank of most powerful launcher on the American market. 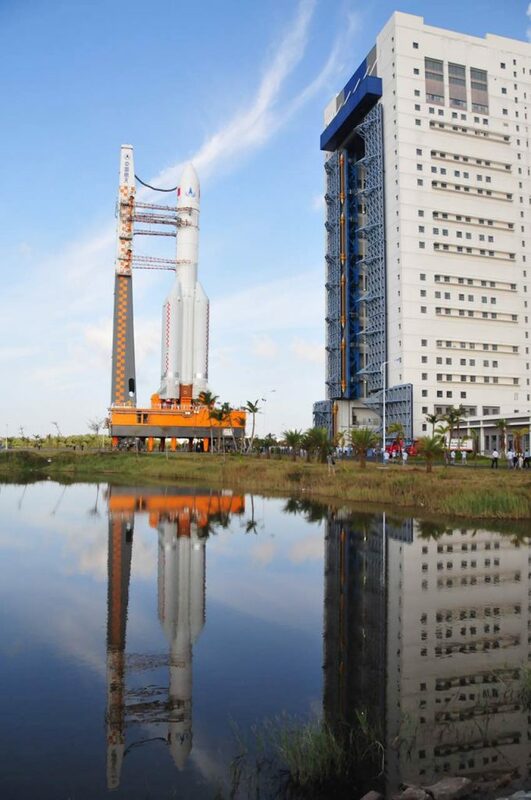 Long March 5 is the fourth new launch vehicle introduced in the Long March series in the last 14 months, covering the entire spectrum from microsatellite launches to heavy-lift capacity provided by the CZ-5. 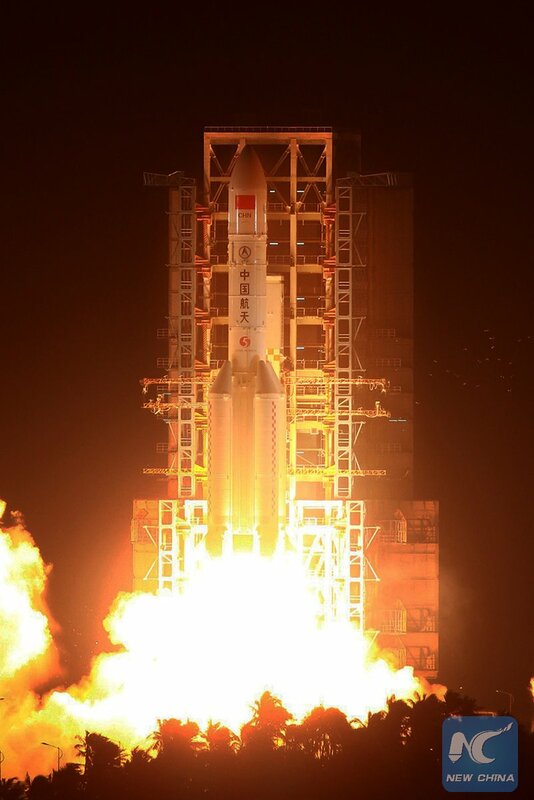 Long March 6, suitable for small to medium satellites headed to Low Earth Orbit, made its debut last year and was followed by the premiere of the Long March 7 this June, expected to become a workhorse for orbital cargo deliveries as well as the Geostationary Launch sector. CZ-11, an all-solid rocket, also flew for the first time last year but is unrelated to the CZ-5/6/7 series. The introduction of China’s new launchers marks a major shift in rocket technology, stepping away from the hypergolic propellants used by the Chinese for more than four decades and introducing Kerolox and Cryogenic propulsion systems that offer a much better performance at a fraction of the cost plus are more environmentally friendly. A high-degree of commonality is employed by China’s new rockets, both in the structures and engine departments, to streamline the production process in order to support an ever-growing number of missions while keeping costs to a minimum. This fast-paced introduction of China’s new launch vehicles was a long time in the making with development beginning on the various engine systems back in the 1990s. Preliminary studies of the Long March 5 design were also underway around that time, but development efforts were only started in 2004 after China had identified the need for more powerful launchers to support a shift toward heavier satellites headed to Sun Synchronous and Geostationary Orbit. Ground was broken for a new manufacturing facility in Tanjin in 2007 while construction efforts also kicked off on Hainan Island where China’s first coastal spaceport was established to host the CZ-5 and 7 rockets. 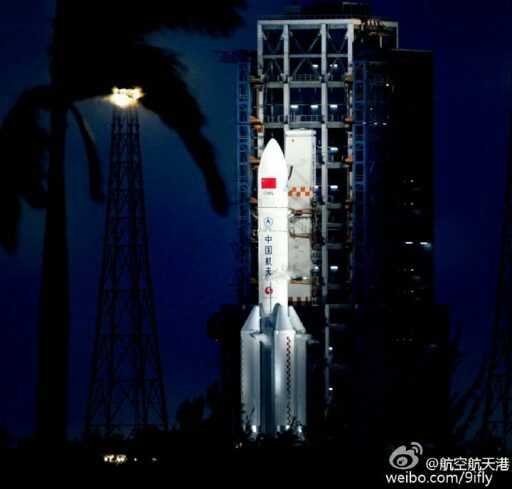 At that point, the maiden launch of Long March 5 was still expected by 2013, though technical challenges such as engine development and machining the rocket’s large five-meter-diameter tanks led to inevitable delays with launch ultimately ending up in late 2016. The first full scale Long March 5 was put through a series of fit checks and fueling drills at the Wenchang Satellite Launch Center in 2015 ahead of the arrival of the first flight-ready rocket in August 2016 for assembly and checkouts. 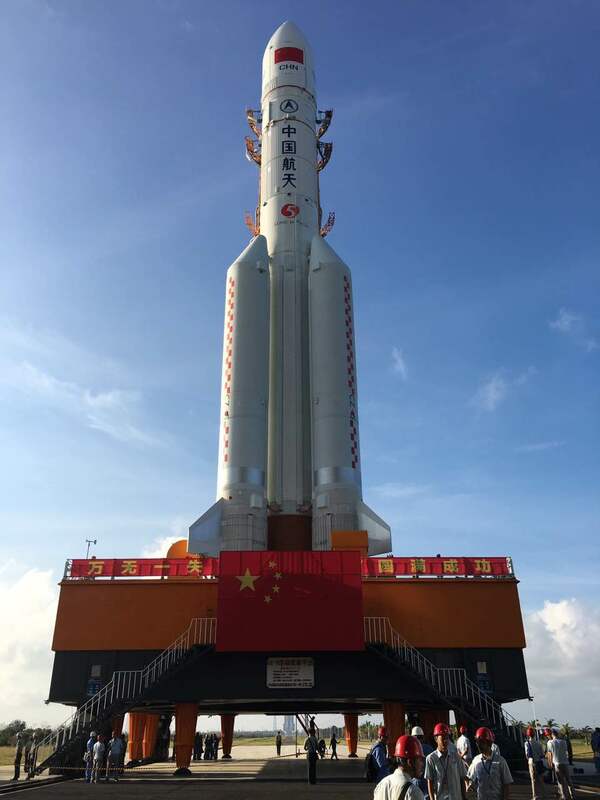 The 57-meter Long March 5 was hauled to the LC-101 launch complex on October 28, located just half a Kilometer from the beach on the north-eastern tip of Hainan Island. Long March 5 is comprised of two five-meter diameter cryogenic rocket stages using Liquid Oxygen and Liquid Hydrogen propellant plus four 3.35-meter Kerosene-Liquid Oxygen boosters powered by a pair of engines. An optional Yuanzheng-2 Upper Stage can be added to the stack for direct deliveries to Geostationary or Medium Earth Orbits. Initially, Long March 5 was conceptualized as a family of six vehicles to achieve different payload capacities by varying the number and design of the boosters. However, only two variants proceeded into development, the standard CZ-5 with two stages (+optional YZ-2) and CZ-5B that omits the second stage and flies as a Single-Stage-To-Orbit launch vehicle to loft payloads of up to 25 metric tons into a Low Earth Orbit. The vehicle flown on Thursday was the standard CZ-5 that has a launch mass of 867 metric tons and a launch capability of 14,000 Kilograms to a standard Geostationary Transfer Orbit – matching the capability of the Delta IV Heavy and surpassing the Ariane 5 by three metric tons. Finally reaching its launch pad last week, Long March 5 was hidden by its 92-meter tall Service Tower while engineers put the vehicle through final checks before filling the boosters with Kerosene on Wednesday to set up for cryogenic tanking that was performed during the final countdown hours on Thursday. Loaded with over 725 metric tons of Kerosene, Liquid Oxygen and Liquid Hydrogen plus Helium tank pressurization gas, Long March 5 quietly sat on its launch pad as it awaited a 10 UTC liftoff. However, that time came and went and launch was pushed to 11:01 UTC and then to 12:40 UTC – likely due to last-minute teething issues on the rocket or launch pad as can be expected for the first launch of a brand new rocket. 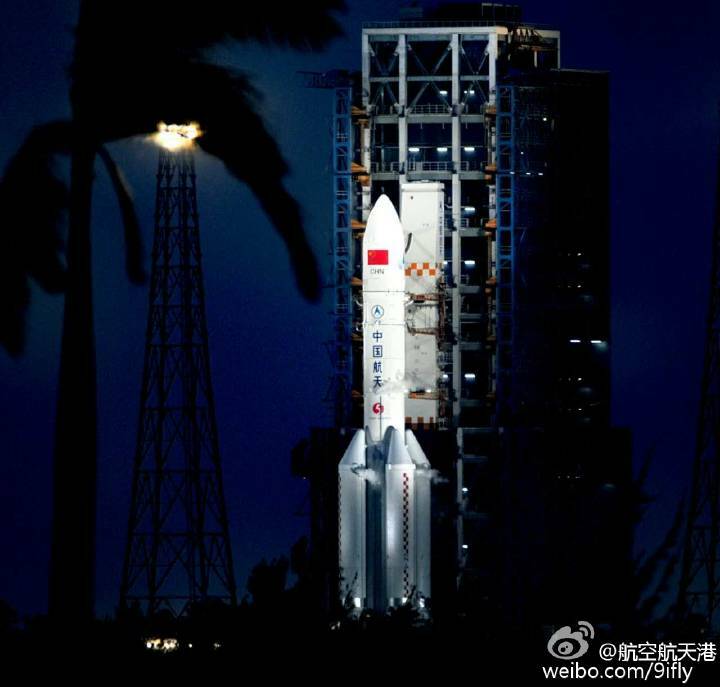 A large crowd of spectators gathered in designated viewing areas to watch China’s most powerful rocket take flight. No live coverage of the launch was provided by state-run media outlets, but media representatives provided independent web streams of the launch and many took to Social Media to stream live video from the launch site. Red flames erupted from the base of the Long March 5 six seconds before liftoff when the twin YF-77 engines on the core stage started up followed moments later by the eight YF-100 booster engines, giving the rocket a total liftoff thrust of 1,078 metric-ton-force. Liftoff was marked at precisely 12:43:13.998 UTC, 8.40 p.m. local time. 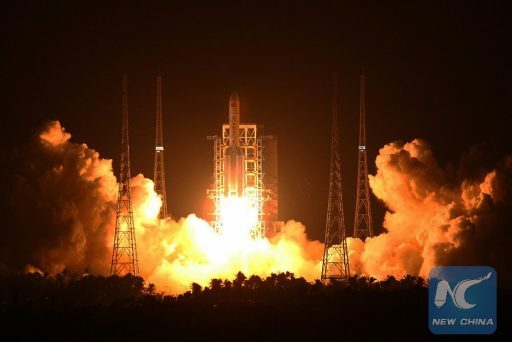 Rising from its launch pad, Long March 5 gave spectators a powerful but only brief show as it quickly disappeared into a dense layer of clouds over Hainan Island. After a short vertical ascent, Long March 5 pitched and rolled onto a path taking it to the south east towards the equator, departing the island on what will become the rocket’s standard route for Geostationary Missions. The boosters fired until T+173 seconds, each generating 240 metric ton-force of thrust to help accelerate the rocket to a speed of 2.7 Kilometers per second. The YF-100 – an oxygen-rich staged combustion engine – had already proven itself on the maiden launches of the Long March 6 and 7 that also employ it as a core/booster engine. It is based on the Russian RD-0120 that was acquired by China in the 1990s to make use of Russia’s pioneering oxygen-rich closed cycle that offers an extremely efficient use of propellants to maximize performance. 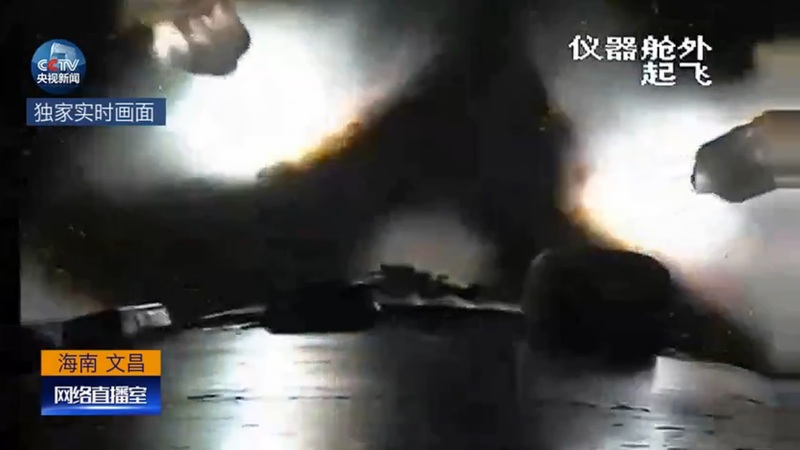 Onboard video showed the four 27-meter long boosters making a clean separation around 72 Kilometers in altitude, swinging outward and away from the core stage that headed onward powered by the two YF-77 engines alone, delivering a vacuum thrust of 142,650 Kilogram-force. YF-77 is China’s first high-thrust full cryogenic engine, marking a significant technological development. Employing an open staged combustion cycle, YF-77 was built to be efficient at sea level and in the tenuous upper atmosphere to be suitable for a long-burning core stage. 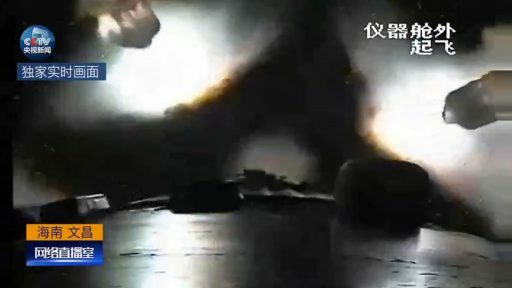 Four minutes and 35 seconds into the mission, Long March 5 split open and separated its 12.5-meter long fairing halves, having reached an altitude of close to 150 Kilometers where aerodynamic forces could no longer harm the upper composite comprised of the experimental Shijian-17 satellite and Yuanzheng-2 upper stage, also making its debut on Thursday. The core stage finished its job approximately seven minutes and 55 seconds into the flight, having consumed nearly 160 metric tons of cryogenics to accelerate the stack to a speed of 5.8 Kilometers per second. Separation of the 33-meter core stage occurred moments after shutdown and was followed by the ignition of the second stage to finish pushing the vehicle into orbit. Stage 2 is powered by a pair of YF-75D engines, each delivering nine metric-ton-force of thrust, employing an expander cycle in which the Hydrogen propellant is expanded into is gaseous phase to drive the turbopumps. 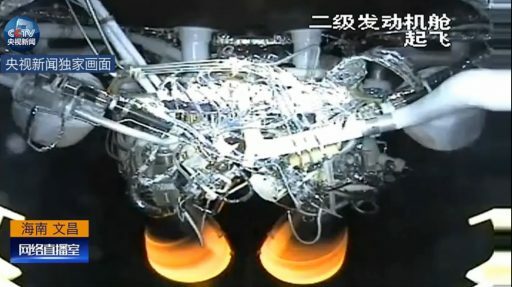 The engines are highly throttleable and can be ignited multiple times to allow Long March 5 to support flexible mission profiles. A standard Geotransfer mission encompasses a pair of firings of the second stage, the first around six minutes in duration to raise the vehicle’s speed by two Kilometers per second and reach a Low Earth Parking Orbit around 170 Kilometers in altitude. 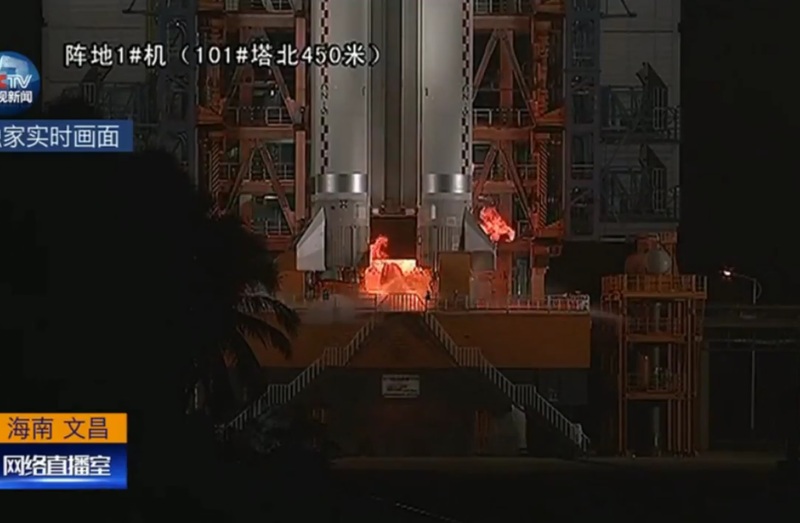 Concluding is first burn, the second stage coasted for eleven minutes to move to a position close to the equator in order to set up the proper injection parameters. The two engine nozzles began glowing bright orange again when the second stage re-started on a burn of just over four minutes to boost the stack into a highly elliptical sub-GTO-type orbit. 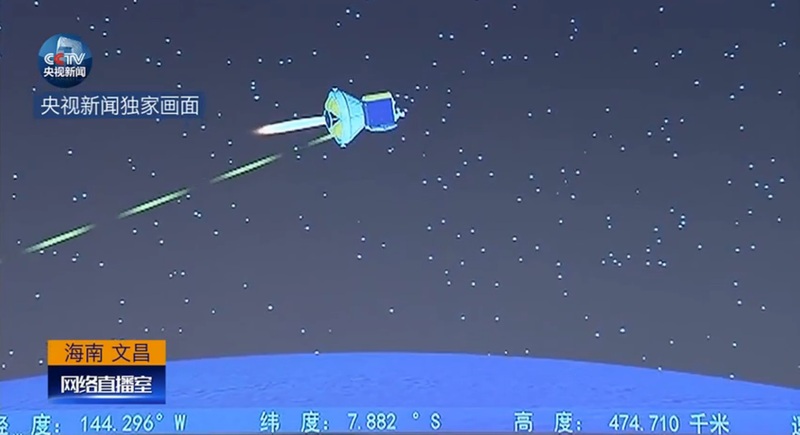 Loud cheers emerged when the Yuanzheng-2 upper stage separated from the booster right at the half-hour mark into the flight, marking Mission Success for the Long March 5 rocket. Assuming control of the flight, Yuanzheng-2 immediately fired its hypergolic main engine for a short supplementary burn to raise the high point of the orbit to Geostationary Altitude at around 36,000 Kilometers. Next was a coast phase of around five and a half hours to allow YZ-2 to climb to the apogee of the orbit so that its second burn can circularize the orbit and reduce its inclination to reach a Geostationary Orbit for spacecraft separation at 18:57 UTC. Hitching a ride on the debut mission of Long March 5 is the Shijian-17 experimental satellite, joining a program dedicated to a variety of objectives including in-space technology demonstrations. According to reports, Shijian-17 will demonstrate an electric propulsion system for stationkeeping and maneuvering in Geostationary Orbit, adding another important technology to China’s repertoire for implementation on future Geostationary Satellite Platforms. Sporting electrical propulsion will give Shijian-17 plenty of maneuvering capabilities that could be used to test out a rendezvous and inspection architecture as was already demonstrated by the Chinese in a Shijian mission in Low Earth Orbit.